After posting about my Chippendale dining chairs, I have received numerous questions and requests for more details. A follow-up seemed to be in order. This is one of six mahogany chairs in my dining room. Sometimes when I paint I have a clear idea of what I want for the final result. Not this time. It was more that I wanted try out a new (for me) color of Chalk Paint, Louis Blue and I needed something to paint. So I painted all six chairs before I decided maybe Louis Blue was not the best color to go with a dark mahogany table in a warm white dining room. The second coat of paint was a mix of Old White and Louis Blue. Still not right. Next, out came the Provence, then a mix of Provence and Old White. Every time I added another color of paint, I would have to paint all six chairs. Aubusson Blue was added in the crevices. Still not quite right. The almost final coat was Old White dry brushed around the edges. Almost perfect. Well maybe not, but the thought of painting six chairs again was too much even for me and I love to paint. So I proceeded to the next step…..clear wax (x6), and finally the dark wax (x6 again). Finally, finished! At least for a while……until, months later I had finished another project involving Pure White. I had paint left on my brush and rather than waste it, I did a little dry brushing on one of the chairs. Yes! That was all it needed…. except “it” was a “they”. Five more in fact and more waxing. I am happy to say, over the course of several months, every time I had some Pure White left over I would add it to another chair. Slowly I worked my way through all six, and now they mostly match. Lesson Learned. Never paint one in a collection unless you are absolutely sure about the color. Repainting one is no big deal, but painting six is. 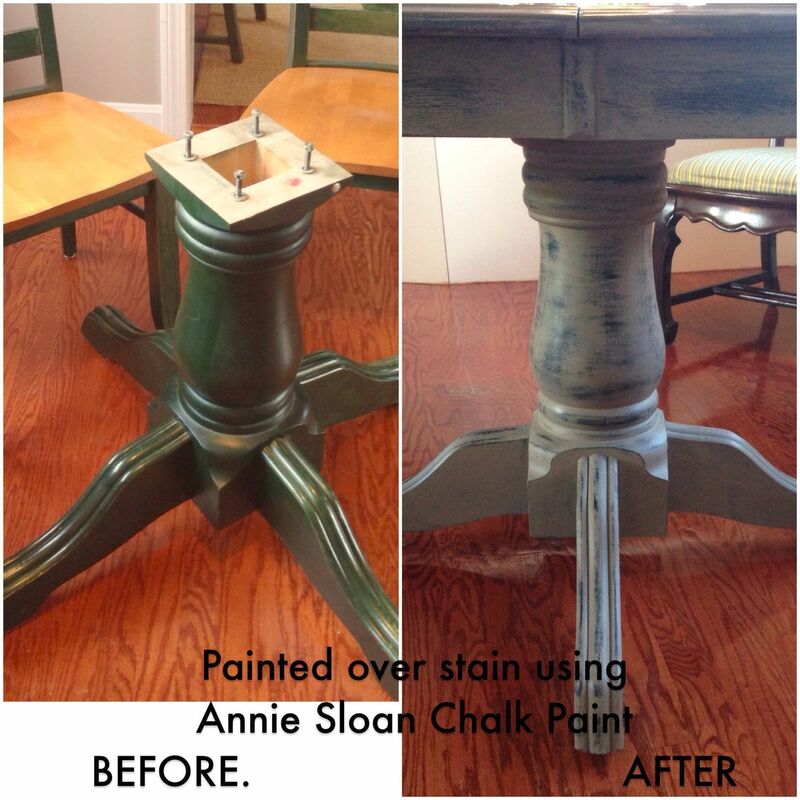 And, more importantly, you can not ruin any piece of furniture with Annie Sloan Chalk Paint. If you make a mistake, or don’t like it, just keep adding paint until you do. If I had used latex or oil based, I would have had to strip and sand and probably would still be doing it now. Or more likely, I would have given the chairs away. Thanks for the information about your process with the chairs. I’m painting a small table right now and am struggling with the colors. I’m going to keep painting till I like the result. Your chair is beautiful! Does it help you to know you aren’t the only one who has made some ‘time consuming’ mistakes on chairs? 🙂 These turned out beautifully, though. Thank you for sharing your ‘layering’ technique! I love this layered look. I did 6 chairs and a pedestal table myself and it’s time consuming. I have a bureau I painted with graphite but I don’t like it. I need another color over it then distress a bit to bring out the black. What colors do you like to use with graphite? Hi Leslie thanks for the quick response! Here is a pic of my chairs I did in graphite and coco over it. The original color was a green stain. Thanks for sending the photo of your chairs, they look fantastic. I like the way you did your layers with Graphite and Coco. Let’s keep in touch!